Thanks for the excellent article. 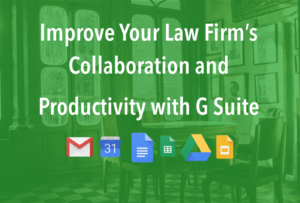 I have been wondering for a while whether there are medium sized or larger law firms actually using G Suite (I have heard of small groups of lawyers who do). The reason why I’m asking is that I’m organising for my Institute at the University of St.Gallen a lecture series and I am hoping to get someone to speak for 30-45 minutes about the use of G Suite in law. I can’t say I’m an expert on the topic, but feel free to reach out to the author of the post (this was a guest post). I’d be interested to hear about the feedback you receive from the lecture series.